After many years of giggles, smiles and laughter we are saying farewell to our beloved Snapper Jaxx kids’ club and hello to our brand-new kids’ club, Barrel O’ Fun! Check out our new FREE kids’ club from 10am to 3pm on selected Tuesdays during school holidays. You can still expect interactive storytelling and engaging craft activities, but this year we have two new hosts and a barrel full of fun props. Not only that, we also have a loyalty card to give out and will be rewarding families who attend three or more sessions with a goodie bag full of treats. Our kids’ club will take on an overarching history theme for the year…WHEN ON EARTH? Brrrrr, it’s cold outside! Make sure you wrap up warm as we travel back in time billions of years to The Ice Age. You’ll become cavemen and cavewomen as we explore hand paintings and Mammoths in this chilly blast from the past. Hercules, Zeus, Perseus and Poseidon to name just a few, you’ll learn all about Greek mythology and the stories that shape our world today when we go back to this ancient time. 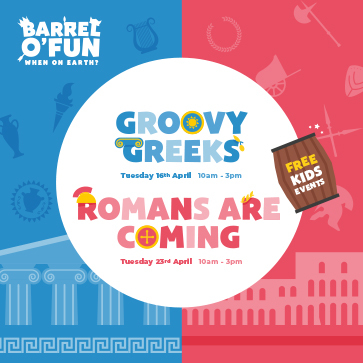 You’ll even be able to take home a little piece of Greek history as we create our very own clay statues! What DID the Romans do for us? Join in with our session at Barrel O’ Fun and you’re sure to find out! From straight roads, to numerals and even working loos, we discover some of the amazing gifts the ancient Romans gave us that we’re still using now! You’ll put on your own toga or centurion’s helmet and create a masterful mosaic to take home. Come join us at our Aztecs, Incas & Mayans Barrel O’ Fun session, where you’ll learn all about the rituals and beliefs of these fascinating people and make your own take-home Mayan calendar. Bring your best ‘Walk like an Egyptian’ dance moves to our Everything Egyptian Barrel O’ Fun session! We’ll learn all about pyramids, mummification and hieroglyphic drawings as we embrace the ancient Egyptian way of life. Pop by to join in with all the fun and take away a personalised hieroglyph bookmark. Ahoy, me hearties! In this session we’ll discover some amazing facts about those pesky real-life pirates, whilst sporting our own eye-patches (and find out the truth about why patches were worn). You’ll create a colourful treasure map to take home and battle a storm in this wild adventure on the seven seas! In this session we’ll learn all about King Arthur and the Knights of his Round Table. Sir Lancelot, Sir Galahad and Sir Bedivere make up some of the 12 Knights according to legends, but is it fact, or just one big fantasy? Come join us at Barrel O’ Fun to find out! Our real ancient Viking, Ivar the Boneless, will lead you on a historical journey to the time of excellent ship making and long boat burials. This along with the shock discovery that Vikings never actually wore helmets with horns will surely set the scene for a fascinating history session! It sometimes feels like the Victorians invented EVERYTHING! From the very first photograph to postage stamps and Christmas cards, we’ll take a look at some of the most famous inventions at our Barrel O’ Fun session. You’ll then have the chance to create and take home your own exciting invention, which could still be used 150 years from now! For centuries the Islamic world lead the way in art, science and literature, so we’re travelling back in time to learn all about them! In this session you’ll create your own colourful geometric design, like those found all across the Persian region from hundreds of years ago.